How does Butterie keep butter soft? It's a scientific fact that butter does not require refrigeration and approximately 70 million Americans keep their butter on the counter all the time. These folks know that butter at room temperature is not only easier to spread, it tastes better too. Yet surprisingly, half of America has no idea that you can keep your butter sitting out all the time. How long can butter stay unrefrigerated? Kitchen Concepts Unlimited, LLC, the maker of ButterieTM, performed a shelf life study on butter. Working with Michelson Laboratories, an ISO/IEC 17025 accredited laboratory, butter was kept at room temperature and tested every few days for spoilage. The lab tested for yeast, mold, bacteria and rancidity; if food is going to spoil, one of those 4 things will happen. Yet after three weeks of the butter being kept between 68-78°, none of the butter showed any signs of spoilage. Yes, three weeks! However, keep in mind butter is still a food. It cannot remain fresh indefinitely, so if your butter looks or smells off, it's best to toss it and start fresh with a new stick. Why would people keep their butter out? Having soft butter always at the ready is a real game changer in the kitchen. No more ripping toast with a cold, hard stick of butter. If you like butter in your baked potatoes, it's soft & ready to go. Love to bake? No more extra step needed to soften the butter. Or when buttering steamed vegetables, it melts instantly. But the best part is that butter simply tastes better when it's at room temperature. Furthermore, many people will buy margarine or tub-style butter flavored spreads because they are easier to spread. But those products are just oil and artificial ingredients. Most people prefer a pure and natural product. If that's you, it's time to make a change for the butter! Please keep in mind... Butter can be stored for up to three weeks at room temperature without refrigeration. Protects butter while keeping your countertop and table clean. 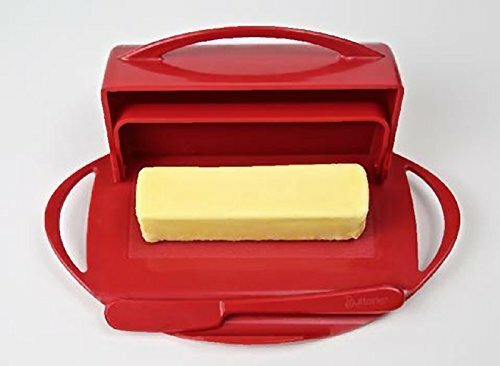 Holds a variety of butter sizes. If you have any questions about this product by Simply Abundant, contact us by completing and submitting the form below. If you are looking for a specif part number, please include it with your message.